459.5.3 The Minister may develop and implement a pilot project to test or innovate distance education or to study, improve or define standards in this area. establish, by directives, the norms and rules applicable. It may also, at any time, modify the project or terminate it after notifying any interested party. A pilot project has a maximum duration of three years, which the Minister may, if he considers it necessary, extend for a maximum of two years. The Minister shall make and publish an evaluation of the pilot project every two years and an evaluation at the end of the pilot project. As of the 2017-18 school year there were no active pilot projects. However, private schools are regulated by a different act (i.e., Loi sur l’enseignement privé) that does contain provisions pertaining to online education. Essentially a private school can request a “derogation” allowing students to be “virtually attending,” which would in theory allow for the formal creation of a virtual school. To date, the Ministry has yet to receive a request for an online initiative that meets the conditions stated in the Loi sur l’enseignement privé for them to approve. The government provides school boards funding for distance education students based upon enrolment at a rate of 80% of the amount provided for a student enrolled in a brick-and-mortar setting. The Ministère de l’éducation et de l’Enseignement supérieur does provide a block grant to the Société de formation à distance des commissions scolaires du Québec (SOFAD) to support their course development activities. Additionally, SOFAD also charged a fee for school boards to use their materials, money that was reinvested in the development of other learning materials. Similarly, the Leading English Education and Resource Network (LEARN) program is largely funded through the Canada-Quebec Entente on minority language education and second-language instruction, which is a funding program managed by the Ministère de l’éducation et de l’enseignement supérieur. During the 2017-18 school year, there were an estimated three distance learning programs in Quebec. The largest distance education program was SOFAD, which primarily develops and produces correspondence distance learning materials that school boards utilize in their own district-based programs. SOFAD also provides an e-learning platform (i.e., EduSOFAD) that offers many of the courses online for the students who prefer to work online. SOFAD served approximately 27,400 adult students who are 16 years or older. While there was no data submitted for the 2017-18 school year, the Centre d’apprentissage en ligne de la CSBE – a distance education program offered by the Beauce-Etchemin School Board – had 149 students enrolled during this school year, and an additional 1366 students took a remedial course through distance education during the summer of 2018. Finally, LEARN provided a variety of distance learning opportunities to approximately 300 English-language students synchronously and 1,300 self-paced students from all nine English-speaking school boards in the province. At present, there are two formal programs that provide blended learning in Quebec. The first is LEARN, which provides its services and resources – such as tutoring, tailored pedagogical content, training, community learning centres’ support, academic peer review articles, curated resources, and enrichment activities – to stakeholders across the province in a blended format. During the 2017-18 school year approximately 120 students were enrolled in these blended learning services, and another estimated 10,000 or more students accessed the blended learning content outside of LEARN’s content management system. The second is the Écoles en réseau (i.e., Networked Schools), which focus on teacher professional development and technology integration projects (e.g., connecting two or more small rural classes together through the use of Knowledge Forum and various synchronous tools in a manner that blends face-to-face instruction with online tools and collaboration). During the 2017-18 school year, Écoles en réseau had approximately 484 teachers in 275 schools participating, representing more than 11,162 students. The history of distance learning in Quebec began in 1946 with the creation of the Office des cours par correspondance, which was attached to the Ministry of Social Services and Youth (at the time there was then no Ministry of Education) and served vocational and professional education. In 1972, the service was extended to general education, then to Collège d’enseignement général et professionnel (CEGEP) courses in 1983, and to the English-speaking community in 1992. Adult education was provided through television in the 1960s, mainly by the University of Montreal and through community television (TEVEC) in the Saguenay-Lac-Saint-Jean area. In 1996, distance education at the secondary level was transferred from the Ministry of Education to the Société de formation à distance des commissions scolaires du Québec (SOFAD), a non-profit organization administered by representatives of various school boards. Most K-12 distance education in Quebec is still limited to students 16 years and older enrolled in adult education and vocational schools. Courses are mostly offered in print form. It is only recently that a few school boards have started offering online distance education. The one notable exception is The Leading English Education and Resource Network (LEARN), created in 2004 by amalgamating the Distance Education and Community Network (inaugurated in 1999) the English and Resources Network, and the Quebec English Schools Network. These initiatives relied on the Chambers Report (Provincial Government Task Force on English Language Education in Quebec, 1992) which recommended that English school boards use digital networks to improve educational services to the English community. LEARN has since been very proactive in developing K-12 distance learning services in Quebec. Please see Soixante ans de formation à distance au Québec for more details (Comité de liaison interordres en formation à distance, 2007). * L’École en réseau uses a model where classroom teachers and students are connected through video conferencing and a knowledge management system. ** Enrollment is done through the school boards. *** Teachers (i.e., markers/graders) are hired by the individual participating school boards and there is no program-wide data available. If a student living in Quebec completes a distance education course from a program located in another province or territory, provided the student has an official document (e.g., transcript) issued from the jurisdiction in question attesting to the student’s successful course completion, credit can be provided using the same process for students transferring from another jurisdiction. The student can present a request to the Centre d’éducation des adultes du Québec to have his or her academic record evaluated. If the course is considered equivalent, credit is granted. If the distance education course is from a program in another country, the responsibility is to the Ministère de l’Immigration, de la Diversité et de l’Inclusion, which analyzes those achievements on a whole diploma, but not a single course basis. 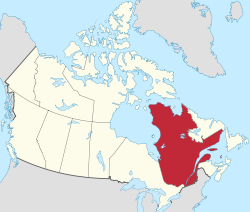 In instances where a student living in another province or territory, or another country, can not pass exams in Quebec (unless they are resident in Quebec). Successful completion of exams for Quebec residents provide course credits.